Mobileye is an Israeli company launched in 1999 from academic research that was building collision avoidance technology using cameras and software algorithms to sense other vehicles on the road to make driving easier and safer. Today, the company has its technology in 15 million vehicles around the world and it is helping make autonomous driving a reality. Mobileye says that autonomous driving has three “pillars,” and that is where the company is focusing its efforts. First, the company produces software that fuses data from both cameras and radar to detect objects ahead with over 99% accuracy. 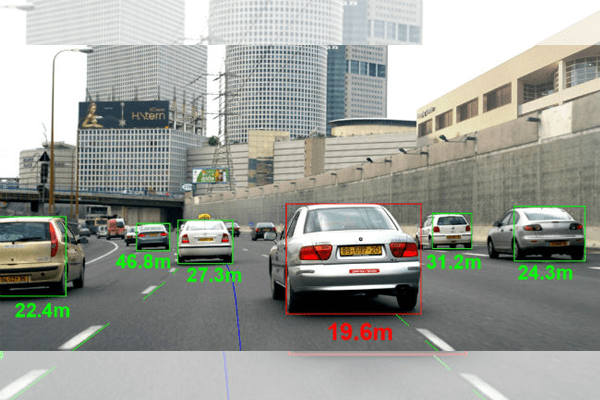 Second, Mobileye uses crowd-sourcing to maintain rapidly-updated, high-definition maps. And finally, Mobileye has developed software with driving “policies” that controls how vehicles will behave on the open road alongside human drivers. What is Mobileye’s Collision Avoidance Technology? Until fully-autonomous vehicles becomes a reality, Mobileye’s technology is being used to help make human drivers be more safe with collision avoidance technology. Fleet managers can utilize Mobileye to help their drivers avoid collisions. One of its most popular products is the 5 Series. The product includes a strategically-placed camera on a vehicle’s windshield that faces forward and acts as the driver’s “third eye.” The devices uses Mobileye’s sensing technology to recognize vehicles, pedestrians, and cyclists around the vehicle. The system also has a display called an “EyeWatch.” This gives visual warnings as well as measurements to the obstacles ahead. In a way, this is similar to the “heads up display” setups that fighter pilots use. The Mobileye system will provide drivers with warnings about impending collisions. This is incredibly important because a driver’s reaction time is a huge factor in car crashes. Studies have found that drivers with faster reaction times may have a better track record of avoiding crashes. It follows that one way to dramatically improve the safety of a fleet of vehicles is to equip each one with technology that can improve driver reaction time. The Mobileye 5 Series can improve reaction time by warning drivers of problems before drivers can detect the situation on their own. The collision avoidance technology warns drivers about potential collisions with cars, pedestrians, and bikers. Drivers can also get a warning when they are drifting out of their own lane (lane detection system) or getting too close to the car in front of them. The display can also warn drivers about their speed and automatically control headlight high beams. Mobileye’s collision avoidance system integrates with our fleet management technology. In addition to providing drivers with immediate warning, longer-term safety can be improved by providing drivers with feedback on how often they had near collisions, got too close to the car in front of them, or drifted out of their own lane. If necessary, the system can even be set up to be tamper proof and track any attempts to disable or alter it. This data can be used to coach drivers for better fleet safety, or if necessary the reports can be used to take action against an unsafe driver.